For nearly 18 years , Sonoma Valley Education Foundation (SVEF) has been a strong ally for local schools, channeling $3,600,000 into public school enhancement. Each local school has received funding, as have many adjacent non-profits such as the Boys & Girls Club, Mentoring Alliance, Boosters Club, and Ecology Center, plus all local PTO’s. Ever since we have been responsive to the changing needs of the district, emphasizing literacy and the arts at first, then addressing tech needs as the digital age took hold in the schools. We trained more than 100 teachers in technology skills through our ‘Earn While You Learn Program’ which was in partnership with the Vadasz Foundation. For years we provided a steady stream of teacher grants for everything from math supplies, and bilingual books, to a puppet theater and a running club. Today we emphasize science, art, school gardens, and teacher support. Our school garden project is a perfect example of our collaborative nature. A newspaper reporter partnered with us and some teachers to get the ball rolling, funders stepped forward, local businesses delivered supplies, wineries sent tractors over and service clubs offered to assist. It is a true community outpouring for the schools. We believe that we are at our best when we work with all interested parties. We believe that it is every child’s fundamental right to receive a good education, and that the quality of education a community provides is a good indicator of its character. Photos on this page: Students at El Verano Elementary School are taking part in an exciting new science curriculum created in partnership with the San Francisco Exploratorium. This program is co-funded by the Sonoma Valley Education FOundation and the Vadasz Family Foundation. Next year this program expands to all 5 Elementary Schools. To learn more, visit Sonoma Valley Education Foundation. 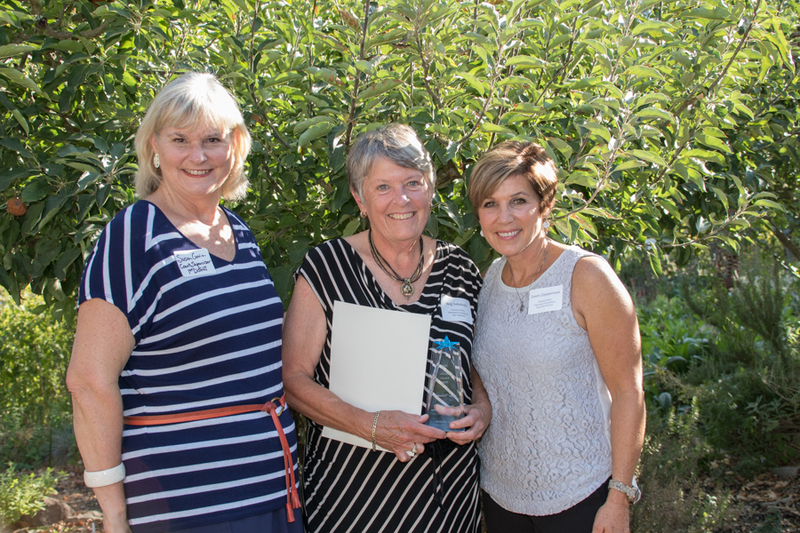 Sonoma Valley Education Foundation's Executive Director Laura Zimmerman (right) and Supervisor Susan Gorin (left) present the Star Award to Meg Sokoloski. Three years ago Meg had just retired from a career as a business executive and became available to help in the Ed Foundation office and with the preparation for the Red & White Ball. Meg has such a joyful attitude and becomes fast friends with everyone she works with. She is a big part of the annual Wine Sponsorship Program. She lines up the sponsors, collects the wine, stores it and then she and her husband Tom make sure everything is ready and running smoothly for guests at the Red & White Ball.